While it can be said that the use of collective labour agreements has greatly expanded during the last decade ¿ witness their growing application in the public sector, and their introduction in many post-communist countries ¿ it is hard to deny that their power to protect employees has diminished considerably and continues to weaken. An understanding of the factors that have contributed to this fundamental change in economic and social conditions is of crucial significance if we are to preserve an equitable balance in the employer-employee relationship. 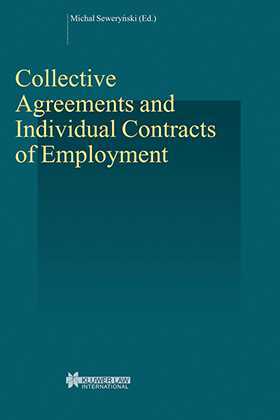 Future prospects for collective agreements as a means of regulating the employment contract. Underlying issues of decentralization, minimum standards, decreasing unionization, unemployment, and the growing individualization of the employment contract are addressed by all the authors. The countries covered are Australia, Belgium, Canada (Quebec), Greece, Italy, Japan, The Netherlands, Poland, South Africa and Switzerland. Collective Agreements and Individual Contracts of Employment offers a convenient platform from which to conduct further research into this complex and dynamic subject. It is sure to be welcomed by specialists in labour law and industrial relations and by other social science professionals.